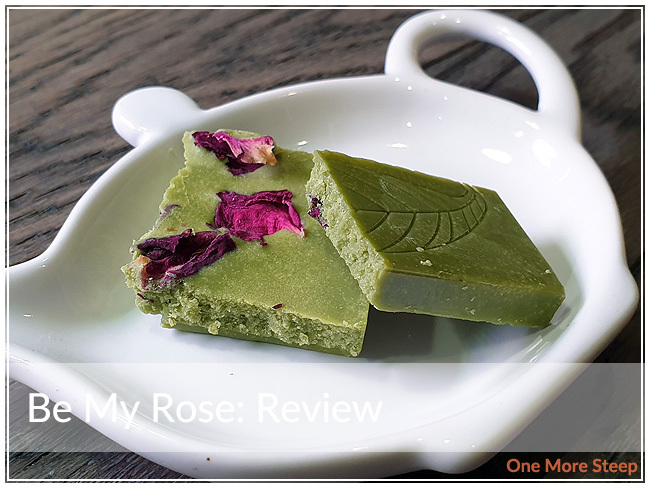 Whisk Premium Matcha has provided me with Be My Rose for the purposes of providing an honest review. Like a lot of other people in the world, I’m a fan of chocolate. I first tried Whisk Premium Matcha’s Matcha Cremsicle chocolate (plant-based matcha white chocolate) when I bought a bar at the 2018 Vancouver Tea Festival. 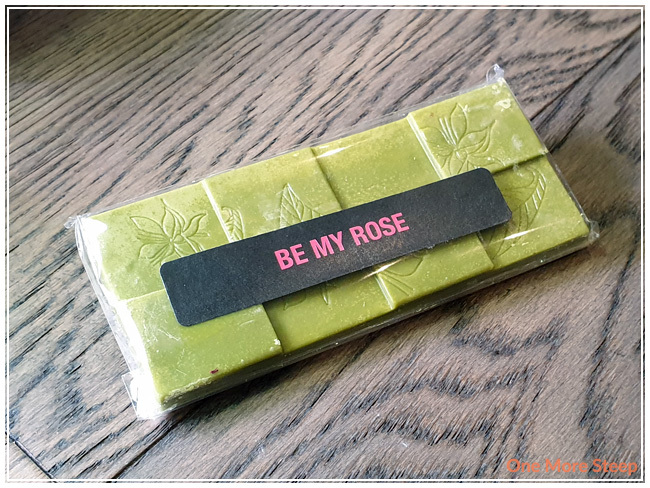 I was absolutely tickled when they very kindly sent me a bar of Be My Rose, which is a very similar chocolate bar – plant-based matcha white chocolate with dried rose petals embedded into the chocolate. The bar of chocolate itself came in a plastic sleeve that’s resealable. The chocolate is molded into square segments, with a floral and leaf pattern molded onto the front, while dried rose petals are present on the backside of the chocolate. Be My Rose consists of: Ecuadorian raw cacao butter, coconut cream powder, coconut sugar, organic matcha, rose petals, maple syrup, and vanilla. Each bar contains a 1.5 servings of matcha per bar of chocolate. There’s a strong matcha aroma from the chocolate, with a very light, sweet floral fragrance that comes off from the rose petals. I broke off a few squares of the Be My Rose to try. There’s a very strong matcha flavour in this chocolate. I love white chocolate, and often find it sweet compared to milk or dark chocolate. Be My Rose is surprisingly not that sweet. 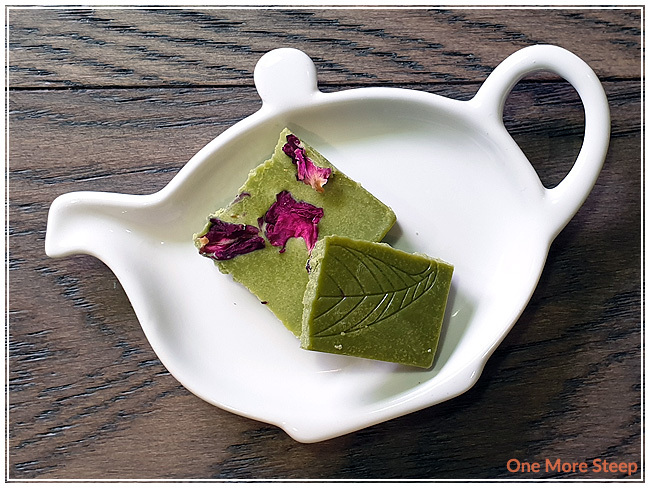 It has a rich matcha flavour, with a floral flavour through each nibble from the rose petals. The chocolate has a nice creaminess to it – I don’t taste coconut in it, in case anyone doesn’t want to taste coconut in their chocolate. The matcha flavour has nice sweet notes to it. I loved Whisk Premium Matcha’s Be My Rose. I really enjoyed eating the chocolate, found it to be delicious. It’s definitely unlike any other chocolate that I’ve had before – a lot of matcha chocolate is often sweet, and the label specifically mentions that it is free of refined sugar – finding the sweetness from coconut sugar and maple syrup. It’s a fun little treat, although I don’t find myself eating more than 1-2 squares at a time, due to the richness in the chocolate itself – so despite the cost for each bar, it goes a long way! What a pretty chocolate bar! Great review.